Bybon 6 Inch LED New Construction IC rated can & trim combo is designed for remodel installations and are suitable for use in ceilings where the housing can be in direct contact with insulation. Pre-installed real nail easily installs in regular lumber and engineered lumber. Air tight construction reduces energy costs by reducing the amount of air leakages through the ceiling. UL listed for damp location. UL listed for feed through certified under ASTM-E283 for Air Tight construction. Meets state of California Title 24 requirements. 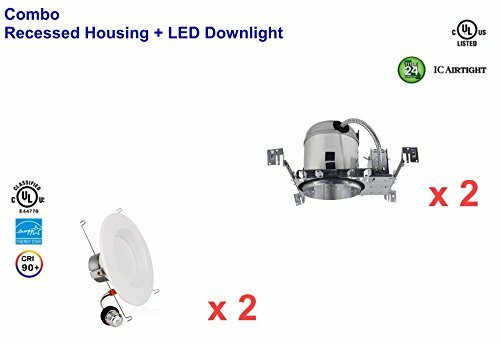 Baffle 11 Watts Output +600 Lumens Energy Star Rated For 120V, 50-60Hz, 350mA Use 1.2W High Power LED Produces 505 ~ 685 lumens output from luminaire, operating by 350mA connect Range 4000K (±200) Color Temp, 90 CRI 10% - 100% Dimmable with most dimmers. Heat sink and aluminum board from low heat operation of high power LED chip. 45,000 hours with 70% maintained lumens. If you have any questions about this product by Bybon, contact us by completing and submitting the form below. If you are looking for a specif part number, please include it with your message.